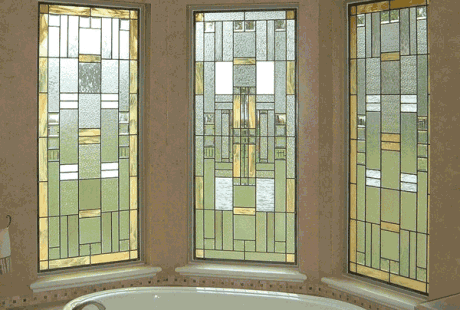 Have you ever considered adding stained glass to the windows in your bathrooms? Of course, stained glass is primarily a piece of art, but it also has some practical applications that many people have never thought of. In many of Houston’s developments, the houses were built so close together that neighbors can see right into each other’s rooms. This is uncomfortable in any room, but most definitely not what you want for the bathroom! Many modern Houston homes are built with a lovely picture window or bay window next to the tub. This is particularly popular in the master bathroom. This is a beautiful design feature if your window opens up into a big back yard, greenbelt or unobstructed view of a lake, but not so beautiful if it opens up onto a neighbor’s home or a strip mall. Many Houston homes are now using stained glass bathroom windows as the perfect remedy – unlike blinds or shades, stained glass adds beauty and value along with privacy, and lets the sun shine in. Bathroom windows are one of the most popular locations to install our colorless leaded windows. These styles are built with interesting textures, beveled glass or even etched glass. Stained glass windows can give you just the amount of protection from prying eyes you are looking for, look lovely and elegant, and even provide an extra layer of insulation. And while you’re at it, a matching stained glass door for the shower would look pretty amazing. 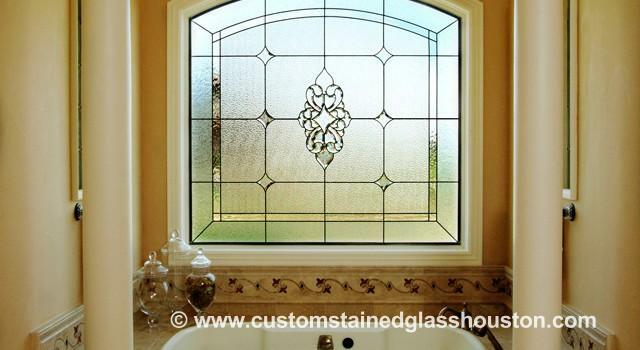 Scottish Stained Glass is custom made, so it can be applied to any size or shape of bathroom window. Talk to one of our Houston designers today to see the incredible selection of styles, textures, colors and designs available. Bathroom windows have some specific needs that other windows in your home don’t have. For instance, because of the amount of moisture present, we will often sandwich the stained glass panel in between two other panels of regular clear glass. The clear glass is easily cleaned, and the stained glass panel is protected from fogging, dirt or mold. This allows our glass to be easily cleaned and remain free of any fogging or mold issues. You could expect a stained glass panel installed in this way to last for decades without losing any of its structural integrity or elegant beauty. Perhaps even centuries? Most of our clients consider their Houston stained glass windows, whether in the bathroom or anywhere else, as featured attractions of their home. They most definitely raise the home’s resale value, and are sometimes the main thing that makes your home stand out from others when you decide to sell it. Each Houston stained glass bathroom window is custom designed and hand crafted to your specific needs and individual tastes. These windows are certainly a unique solution to a privacy problem. We think you will be surprised and pleased at how affordable they are. Give us a call today, to talk with one of our designers about your needs. We look forward to working with you.